There may be hope for Microsoft’s Surface after all. This evening while waiting for a seat at out local watering hole, Victory Brewing Company I took notice of a guy checking in and waiting next too me. It looked like he was holding a Microsoft Surface tablet and I walked up and asked, “Hey is that a Microsoft Surface Tablet” you have there? He responded that “Yes – indeed It was’. We then had a great conversation comparing it to Apple’s IPAD. It was quickly established that we were both in the technology field and we both believed it was far superior to the IPAD in many ways. In fact I asked him if he “missed his IPAD” at which he responded that he lost track where “his IPAD even was at this point”. We both agreed that the small sleek form factor with the ability to install and run any Windows application made the surface the best tablet on the market at this point. 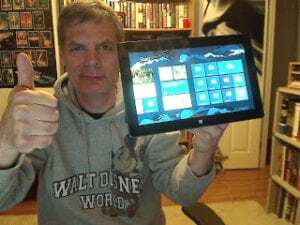 In addition we both agreed that the Surface tablet had enough computing power to – in many ways replace both the tablet and the laptop, resulting in a much easier life for many of us. Our conversation sadly ended when our table was ready and I could see the wife walking off into the distance.. looking back and me… after which I said goodbye and followed Mrs. Mann.